Harvesting red and golden beets fresh from the garden. Preparing for a local Seedy Saturday today has me thinking about my journey as a gardener. On reflection, I realize that I am entering my 27th year of growing veggies, herbs and flowers. Wow. 27 years! Growing in downtown Kitchener, then growing in small-town Wiarton paved the way to growing on our rural property and finally growing for market. I guess I might have a little to share with budding enthusiasts, after all. Want a Successful New Garden? Preparing the beds for next spring’s planting. After weeding (whew!) the beds were broad forked, amended with organic fertilizers and raked to a smooth finish. It is totally normal to be super enthused to start your new garden. Most garden burn-out occurs in mid-season when the weeds have overtaken the soil and garden work turns into a sweaty, sun burned, horse-fly biting war. Don’t buy the line that there is a “lazy gardening” style of gardening that actually is successful. Growing and tending a garden is WORK. If you don’t have a lot of extra time to throw at your new project, starting with a smaller area is a wise move. You can always expand as you gain skill. You can grow a surprising amount in a small space. I recommend two classics on the subject Square Foot Gardening by Mel Bartholomew and How to Grow More Vegetables John Jeavons for more details. Choose plants that get your attention, whether by stimulating your appetite, your nose or your eyes. Stick to growing veggies and herbs you think are delicious and actually like to eat. Grow flowers that smell wonderful and make you smile. When you are engaged with your garden, you will have more success. Because, remember that it is going to be work. You should get a nice reward for all your efforts. Well composted chicken litter is just the ticket to get the soil going this year. Let’s just agree that soil is not dirt. Soil is a living ecosystem of fungi, bacteria and other characters, that functions best with lots of diversity. Synthetic fertilizers and pesticides kill off that life in the soil, leaving it out of balance. Without all the necessary diversity, soil minerals are inaccessible to plants, and to you. Your growing practices will directly affect the nutrition in your plants. Steer away from the Miracle-Gro box and look into compost, mineral powders, fish emulsion, kelp and other more natural products. Young broccoli plants are protected from insects by floating row cover. Even though your new garden may take a while to get noticed by random munchers, you should take action to protect your plants. First of all, think about a fence to keep out the larger critters. Rabbits, deer, groundhogs, dogs and cats (and sadly, humans) can quickly destroy your garden in one visit. Smaller pests can be kept away from your plants with a variety of physical barriers. Many creeping insects can be deterred by barriers of diatomaceous earth powder, ash or sand. Poly fabric and insect netting can be draped directly over garden plants or over hoops installed to support the fabric. 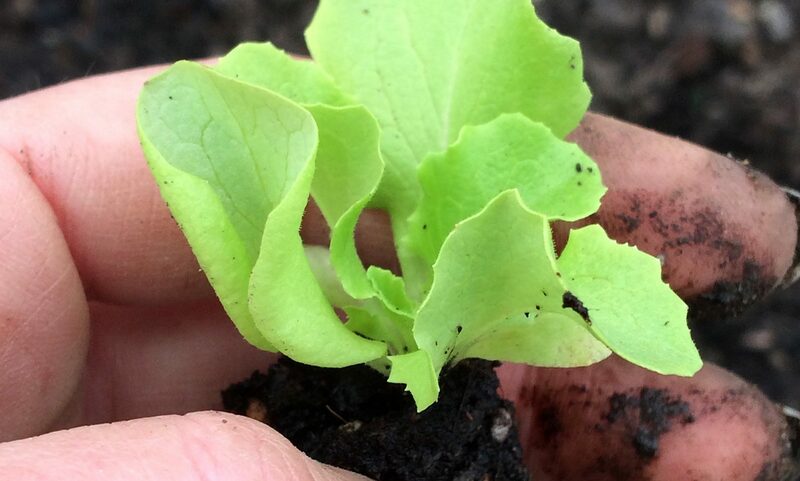 It is especially important to protect members of the broccoli family (including kale, bok choi, arugula, cabbage and a number of asian greens) in this region of the world where flea beetles and cabbage moth caterpillars are abundant. Get your supplies on hand BEFORE you see a problem. Hand watering seems romantic in the spring. The romance wears off pretty fast. 5. Spend cash to improve your experience. Get the best quality you can. Buy from seed companies that trial the vegetables they sell. Don’t forget to choose vegetable varieties that list “great taste” as one of their attributes. You don’t want to go to the trouble of growing your own veg, then end up with just meh flavour. You can get that at the grocery store. For more on the inside scoop on seeds and seed companies, I highly recommend Gardening When It Counts by Steve Solomon. Irrigation kits of all sizes are now available. To me, hauling water is fun for about the first month of spring. Then it eats up a lot of valuable time that could be spent in other parts of the garden. Or life outside the garden. Automating this task, to even one area is a huge time saver. We wrote about our experience putting irrigation in our hoop house here. Get (or make) the best quality compost you can get your hands on. Seek out excellent organic fertilizers and minerals to feed that soil life. As stated above, you are what you eat. And you are what you eat eats. This year we will be experimenting with the Johnson-Su composting bioreactor to create more microbially active and fungal dominant compost. It sounds very high tech, but I assure you, it is not. More on this system can be found here. Well there’s a quick list that Mr. Google will like. It just scratches the surface (no mention of tools, mulch, or gardening gloves!) but I hope this has helped any newbie gardeners out there. And you seasoned gardening folks, what would you recommend from your experiences? More snow!!! Ugh. At least there will be lovely moisture for spring growth. Catching up was wonderful boost to our morale! Thanks Erin! I’m excited to get things going. Zyan has already started his cantaloupe in the house. Looking forward to visiting you and your garden in season! Sign me up for farm updates!